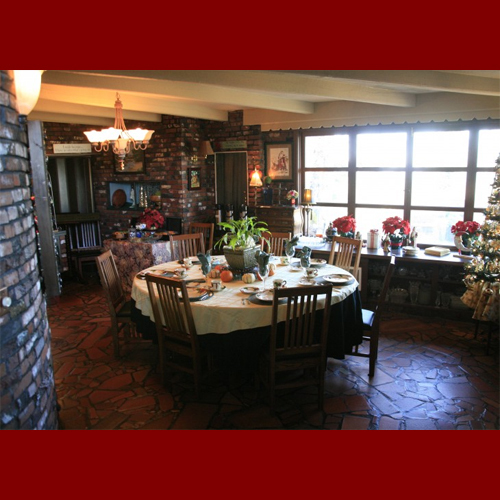 If you are in the Corbett and need a place to stay, Brickhaven Bed and Breakfast is a perfect place to stop. Beautiful views of the Gorge and right along the Historic Highway, This makes a great place to stop whether you are looking to get away for home or are exploring the Gorge. Upon arriving at Brickhaven you will walk through the lush garden across a hand laid recycled brick entrance into a one of kind of architectural wonder. Designed and built in the 1950s by Portland’s Commercial Cartoonist Ernie Hager, Brickhaven is constructed in a Frank Lloyd Wright Architectural style using recycled bricks and is decorated in an eclectic artistic decor. Sculptures, artwork and antiques are tastefully placed throughout Brickhaven each with a story of it’s own. Stepping outside onto the massive Brick paver patio you will be treated to a stunning view of the gorge and manicured grounds. Guests enjoy the privacy of elegantly appointed guest rooms, each with it’s own stunning view of the gorge. Enjoy nature through vaulted windows in the spacious sitting room. Tickle the ivories of the 1907 Steinway Grand piano, or enjoy the solitude by the fireplace.